Hi everyone! Just landed in Austin, TX for Esca Bona and I am so excited to spend the next few days with like minded entrepreneurs, business owners and brands in the food space, discussing how we can magnify the positive innovations being made in the world of natural products. The event started just last year and I heard such amazing things, I am honored to be one of the official influencers at this year’s event. Be sure to follow me on Instagram and Snapchat (username: “anyakaats”) to catch all the behind the scenes from Esca Bona! While it may be 90 degrees in Austin, it was definitely a little cooler in San Diego before I left and due to the change in seasons (yes, I promise we have seasons in SoCal), I was craving soup. 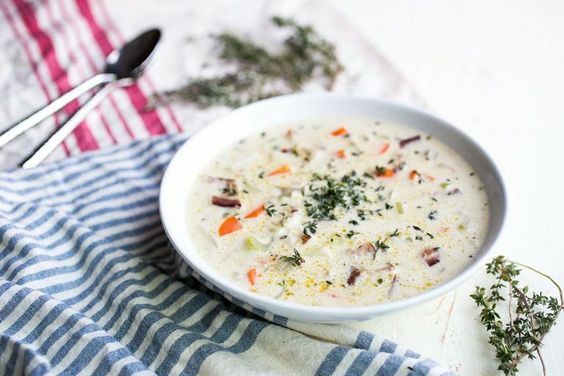 I remembered that I had a few cans of clams that had been sitting in my cabinet for who knows how long, so I decided to create a dairy-free clam chowder! 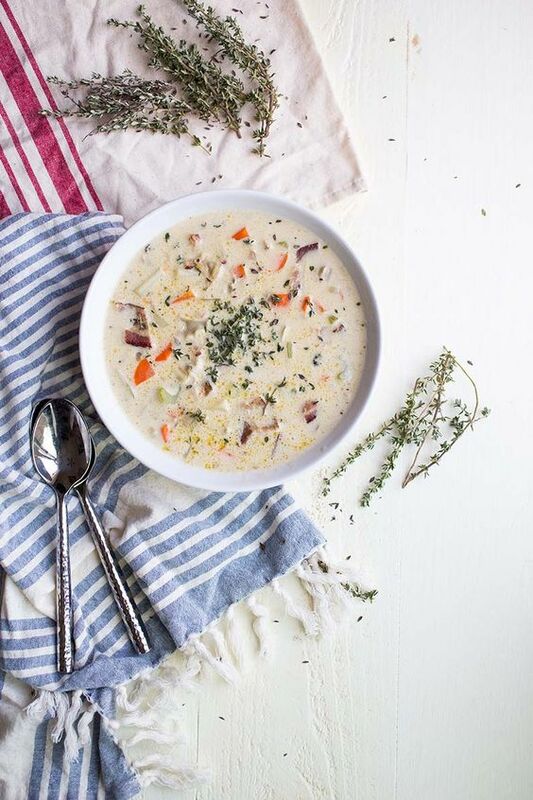 Although the photos for this soup may not make it look thick & creamy, it absolutely is. I actually took the photo before the soup was fully cooked (thank you shorter days and less natural light), but the longer you cook this soup, the thicker it gets. The result is 100% the texture of the real deal and the taste is just as good. Don’t be intimidated by the seemingly long ingredient list either. 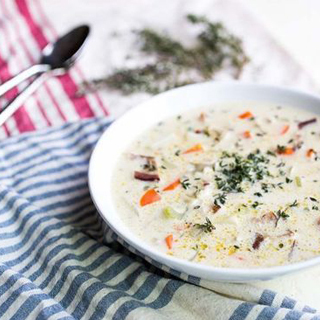 This soup is surprisingly easy to make! Line parchment-lined baking sheet with bacon and cook for about 20 minutes or until just crispy. If you aren't using thick cut, cooking times may vary. Just pay attention to the oven and make sure the bacon doesn't overcook. While the bacon is cutting, chop the onion, garlic, carrots, celery, potatoes, thyme and clams. Set aside. When bacon is done cooking, remove from the oven and pour the fat into a large pre-heated soup pan. Add the onions, followed by the garlic with a bit of salt and pepper until fragrant and onions start to become translucent. Add carrots, celery, potatoes and thyme and cook for another 5 minutes or so. Add a bit more salt and pepper. Add 2 cups chicken broth, chopped clams and clam juice to saucepan and stir occasionally over medium heat. While the broth is heating up, drain cashews from the water they were soaking in and add them to a high-speed blender along with the remaining 2 cups of chicken broth. Blend until well combined and completely smooth. Set aside. Chop the bacon you previously cooked which should now be cool enough to handle. Add chopped bacon, cashew mixture and the can of coconut milk to the pot and stir to combine. Bring the entire soup to almost a boil, but reduce the heat once you see the liquid start to bubble just a little bit. Cover and simmer for 30 minutes or longer, until desired thickness is reached. The longer you cook the soup, the thicker it will become. It's important to monitor the soup and stir it at least every 10 minutes or so to prevent sticking and to check the thickness. If for any reason you make it too thick, you can always add a bit of water or more broth. Eat warm or save in the refrigerator or freezer for an easy, re-heatable meal! i made this with the instructions exactly and 1 hour and half later simmering its still not thickening up. i like it generally really thick, so is this even possible with this recipe? would you suggest a thickening agent, such as a flour? thank you for sharing this, the flavor is great so far. You could definitely use a thickening agent but I am surprised it didn’t thicken up for you after some time. I had my doubts on the chowder being thick enough. Make sure and add enough potatoes. The chowder I made was so thick that I had to add more coconut milk (which I will not do again, too much coconut flavor). I was so impressed at how thick this chowder turned out. The flavor was amazing and my whole family loved it Anya….I am SOOOO happy with this recipe. I can not tell you enough. Bookmarked for life! Amazing! That makes me so happy to hear! I’m visiting family in the New England town where I grew up. I’ve been craving NE clam “chowdah” for years, but I can’t handle dairy. Your recipe looked the most appealing of all that I read over. Good choice, indeed!! My entire family raved about this!! Mom said, “This is a keeper!” I couldn’t agree more! Great work and I will return to try more of your recipes. Thank you! PS-I NEVER review recipes, but for this I felt compelled to give credit to. Wow, thank you! That made my day! So glad you and your family enjoyed it Lisa!! !